Where to start this funny story? I guess I’ll just tell it. I have a Google alert set up for the words “Your Older Brother’s Music Blog” – it tells me when there’s a new post on the Internet with those words in it. Usually, it’s telling me about my own blog. Talk about “great minds think alike!” My doppelgänger turned out to be a college freshman who started a music site – and she doesn’t have an older brother, either! Hopefully I’ll be able to convince her to tell her “origin story” here sometime soon. Anyway, I wrote her a quick note to say that I really liked her blog’s name. So much so that I thought of it 3 years ago. 🙂 She was super cool about it and has since started changing the name to “Your Older Sister’s Secret Stash” but it sounds like she may change it up some even more. 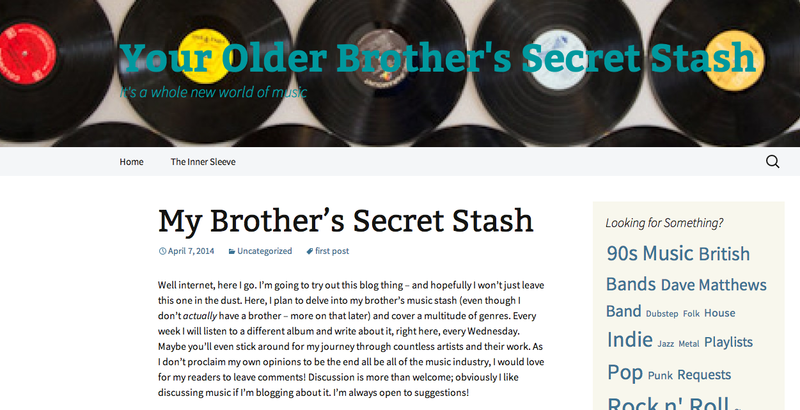 Anyway, go check out her blog – still called yourbrothersmusic.wordpress.com for the moment. She writes with a direct, honest voice and has a really wide music palette. I’m looking forward to reading more of what she’s got to say about life & music. It’s an exciting time for her. Best of luck, Maddie. Let me know if there’s anything I can help you with. She cleverly changed it for you to older sister's secret stash. How nice of her. I think that was really nice of her, too! Gotta love good Internet citizens. 🙂 I would have done the same thing if I were in her shoes. I'm sure I would have been pretty bummed about it.